Yesterday was my birthday and it didn't rain! Haha, usually it rains on my birthday, and it was probably 93 yesterday. I had a really great day. First, I was surprised with chocolate covered strawberries at my door step from a wonderful friend. 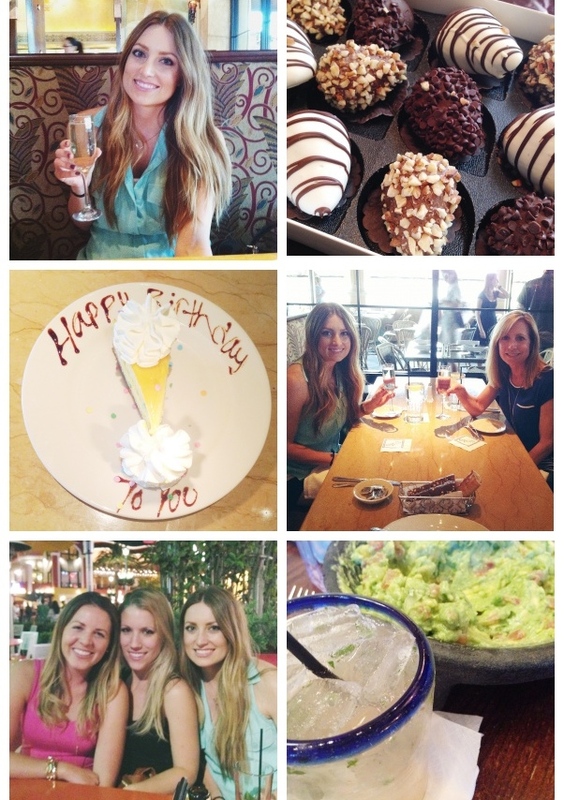 Then my mom came up for the day and we went to Cheesecake Factory to get lunch. We had some delicious prosecco and mango key lime cheesecake which had a coconut macaroon crust...so bomb. We shopped a LOT and kind of lost track of time. Then Andrew took me to Downtown Disney, one of our favorite places to be. We had dinner at Tortilla Joe's, which is awesome mexican food. Tableside guacomole, margaritas, mojitos galore! Two of my bestest friends who were also my college roommates, came out to get drinks after. It was SO great to see them! Overall, I had a perfect day full of people I love.